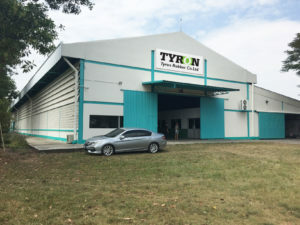 Previously Tyron Runflat outsourced manufacture of its ATR to a third party, this production facility will enable the company to take full control through its new subsidiary Tyron Rubber and ensure that quality is at the highest level. Managing Director of Tyron Rubber Ltd and inventor of the Tyron ATR, Tony Glazebrook, said, “By bringing together the work ethics of Thai and British cultures, we have created a strong company which can compete on the world stage. It allows us to take direct control of the production quality and capitalise on the best of both cultures to deliver an excellent product. “This new facility allows us to reduce the supply chain distances, and hence our carbon footprint, as we are able to source the staple of our product, natural rubber, from local suppliers. In addition we can source quality tooling from Thai toolmakers at 50% of the price in the UK with the result we can turn a new design from idea to production in less than eight weeks,” added Tony Glazebrook. The Tyron All Terrain Rubber (ATR) runflat is a patented device, in service with several armies. In simple terms it creates a platform for the tyre to run on and it incorporates a beadlock so that in the event of a puncture, blow-out or ballistic attack, the vehicle can continue his mission or get back to base and the tyre doesn’t slip on the wheel and the vehicle maintains mobility. Tyron has tested these against the Finabel standards, the international standards authority, and proven that its runflats are capable of running at 50km/h for over 100 kilometres. The ATR is a multipart rubber runflat, which means no heavy hydraulic presses are needed to fit the runflat inside the tyre or take it off when a tyre change is needed. This can be achieved at roadside, using only standard tyre fitter’s equipment. Rubber is inherently malleable and enables ‘over manufacture’ of the beadlock to overcome tyre and wheel manufacturing tolerances. It also allows for different makes of tyres where bead tolerances can exceed 20mm. During installation, rubber guarantees the tyre beads are firmly secured against the wheel flanges, ensuring beadlock. Rubber also absorbs shocks caused by curb strikes, pot holes and a generally hostile environment. It drastically reduces the vibration and stresses transmitted to the wheels, axles and drive shafts, allowing vehicle handling and driver/passenger comfort to be maintained, even in the event of a catastrophic puncture.